Unconsciously people may assign special status to sites that were previously used by other people centuries before. Shown below, a modern nature walk is co-located on top of an ancient medicine wheel, inadvertently preserving the site. Semicircle of stones at “Entrance” is visible in lower right foreground of picture. View is from southeast side of ring to northwest. The path is roughly on the summer solstice sunset angle. 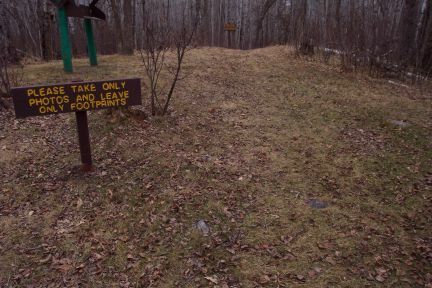 A diamond-shaped group of stones is clustered around the path exit, roughly where the trail sign in rear of picture is shown. The circle is completed around the knoll by stones hidden in the bush at rear of picture.